Pirates' Plenty slot I can tell you with great relief, is a whole lot better than Red Tiger's last pirate-themed game which was the utterly awful Piggy Pirates, a game which had me running out of expletives to describe it. 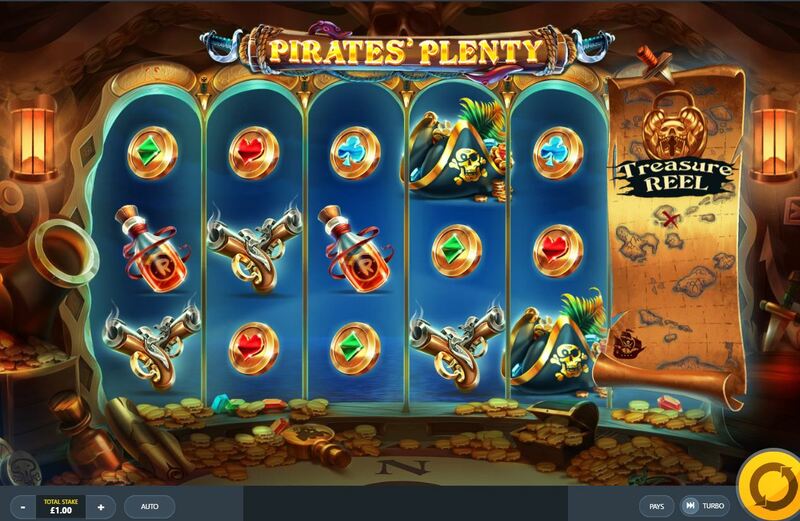 It seems pirate slots have a history of being dreadful with Nextgen's Wild Plunder being only slightly better than the above, same as Yggdrasil's Pirates Smugglers' Paradise. Now here on Pirates' Plenty we get better and more adult graphics and animations with a treasure filled cabin behind the reels and some classical dramatic seafaring music as we play too. Is this initial optimism justified, or will our bankroll be sunk without trace? We have a rare standard grid from red Tiger here on Pirates' Plenty with 5 reels at the start but 6 later, 20 paying lines and 3 rows and a 20-coin bet. The icons are stacked bar scatters and pays for 6-of-a-kinds are: 50x for Skulls, 12x Hat, 10x Cannon, 8x Pistols, 6x Rum with 4 card suits paying 60 down to 30 coins respectively. Now you won't see any Wilds here as you don't get them until you complete the sea voyage on the Treasure Reel beside reel 5. This is achieved by landing the Ship's Wheel and Map icon on the grid which moves you along a small way and can take several hundred spins. When this is achieved, you will find a 6th. reel added to the game and full-reel Ship In A bottle Wilds can then appear which pay with either a 1, 2, 3 or 5x multiplier too. Alas the rules don't specify that if you land 2 or more in a winning combo whether they add or multiply to each other. You can also see a Wild Monkey appear who will remove all low-paying icons from the grid which will replace them with higher ones. They are your enhancements awarded via the Treasure Reel and the Wild Monkey can also appear before the Treasure Reel is activated. 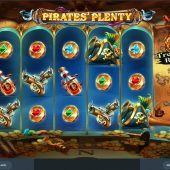 If you land 3 or more Ghost Pirate scatters you will be given 10 free games and another enhancement which may remind you of Netent's Jack And The Beanstalk bonus. This is because if you collect keys on the reels and get 3, you'll unlock the first Chest of the three sitting overhead. This will always award 3+ extra spins and will turn the lowest Club symbol Wild for the remainder. If you unlock the second you will then get 5 free games and turn the second-lowest Diamond symbol into Wild for the remainder. Unlock the third with 9 keys collected and you will have Hearts and Spades Wild and more spins. Given that those card icons dominate the reels you'll be seeing lots of big wins!